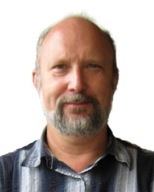 Ralf Stannarius is Professor for Experimental Physics at the Otto von Guericke University in Magdeburg, Germany. He is head of the Department of Nonlinear Phenomena. The group works on the topic of self organization and pattern forming instabilities in soft matter systems such as liquid crystals, LC elastomers, granular materials and ferrofluids. Another focus of research of the group are the structure and dynamics of thin fluid films and filaments, including high speed imaging of these systems. Ines Grodrian is an engineer in the Department. This photo, taken by Ines-Ute Grodrian and Ralf Stannarius shows a glycerol droplet of 30 micrometer diameter, embedded in a free-standing smectic C* film of a commercial liquid crystal (Clariant Felix-16). Under crossed polarizers in the reflection microscope, the submicrometer thick film appears with a characteristic Schlieren texture. The droplet is surrounded by a meniscus of the film material, which is decorated with a colorful corona-like pattern (so-called surface splay domains). The image was taken at room temperature..
Jury comment: This picture has been selected for the beauty of the texture in the free-standing film which is enhanced around the inclusion.